Catching porcupines is a job with serious occupational hazards. This is not for amateurs! A pair of porcupines out on a tree limb. A porcupine family took advantage of this natural hole and denned up inside. Want to get rid of porcupines in your area? Use our nationwide directory of wildlife control operators to locate a professional trapper near you. Porcupines are interesting creatures to be sure, and when they encroach on your property it is time to take action. They pose a danger to people, pets and property. Swift porcupine control is the best way to take care of this problem. The obvious threat of porcupines is their quills. Having these animals den under the shed or in the crawlspace is dangerous, particularly for children and pets. Many dogs never learn the lesson to leave these animals alone. If a person or animal does get stuck with quills, quick medical attention is necessary to prevent infection. The likelihood of being stuck with quills is actually quite minimal unless the animal is provoked. Far more likely is property damage. What property damage do they do? Destroy trees. 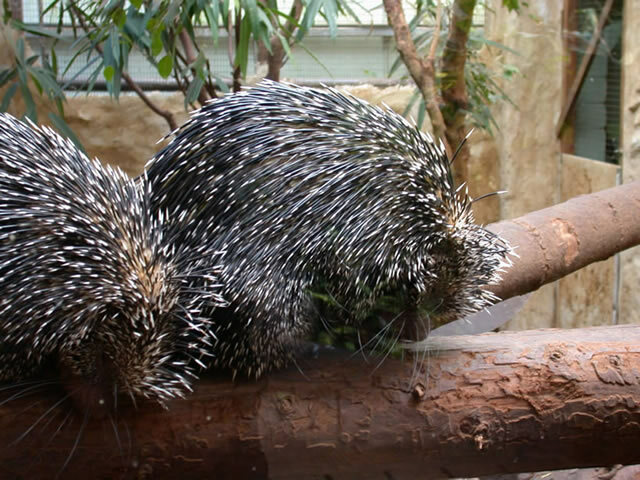 Porcupines expose tree roots, girdle tree trunks, and clip branches off trees with their chewing. All of these things have the potential to kill a tree because they expose the tree to insects, birds, disease and decay. Wintertime is usually when the worst tree damage occurs because smaller vegetation is scarce. Destroy plants and vegetation. 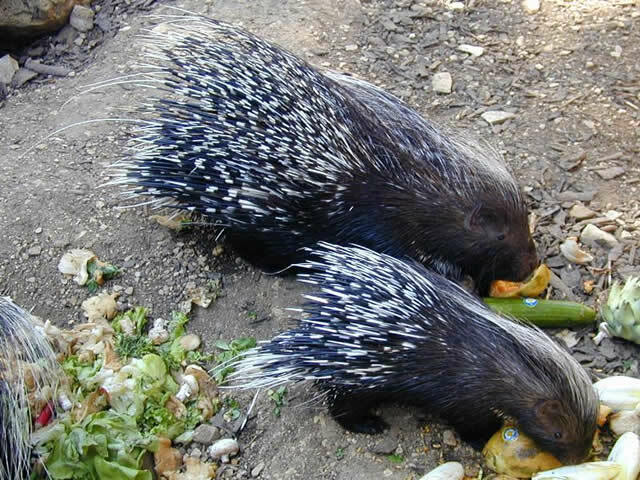 Porcupine eating habits can take a considerable toll on plants and vegetation. Forest plantings, ornamentals, nursery plants, vegetable gardens and orchards are all at risk if the animal is tolerated and allowed to stay and eat. They eat many succulent plants, and particularly like rose bushes, pansies, lily pads, berries, and corn. Damage wooden items. Wooden objects stored in sheds or yards are at risk. Typical damage includes gnawed plywood and pressboard, gnawed siding, chewed up wooden tool handles, and chewed oars. Also common are damages to tree houses, sheds, and barns, which structures can be greatly weakened if their support beams are the targets of chewing. Damage salty items. They enjoy salt and will chew any item that has salt on it. Typical damage includes gnawed leather goods such as saddles (salty horse sweat), gnawed tires (road salt), and chewed up tool handles (salty human sweat). They will also chew on shoes, clothing, and wiring systems found on the undercarriages of vehicles because of the salt that can be found on these items. Attract other animals. The mere presence of porcupines attracts other harmful animals. Coyotes, bobcats, mountain lions and black bears all prey on them. These predators may enter your property looking for a snack and end up causing much bigger problems. Since porcupines are nocturnal animals, they may be able to do quite a bit of damage before you realize what is going on. 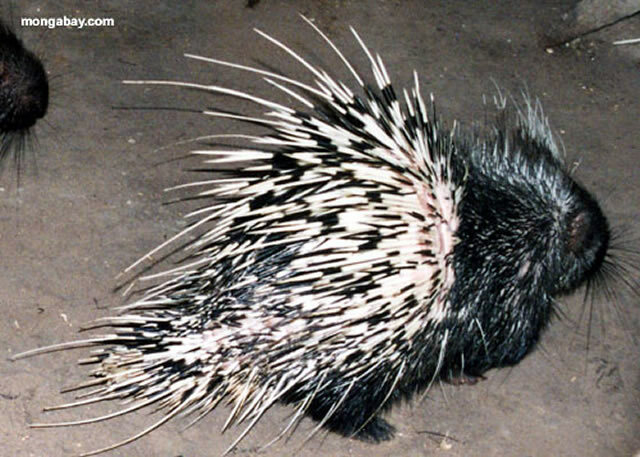 Rabbits, deer, and other animals are often suspected when the real culprit is actually porcupines. 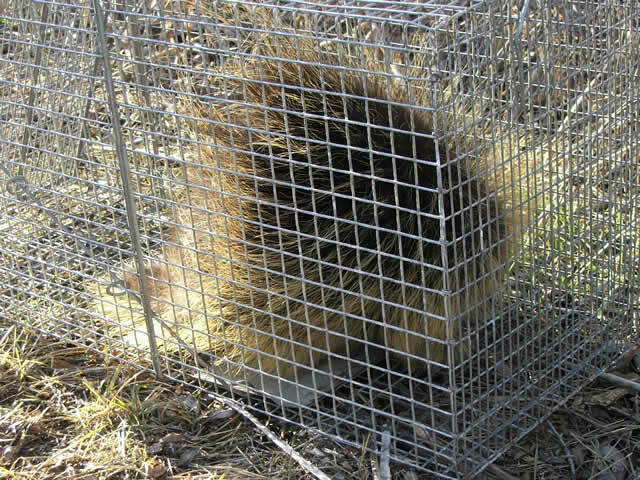 The best method of porcupine removal is to trap the animals. Trapping porcupines is best done by a professional with the proper traps, tools, and experience. Allstate Animal Control can provide you with the professionalism of professional trappers; this is what you need to do the job thoroughly and protect yourself and property. Once the animal is caught in a porcupine trap, our technicians can clean up any mess it made and sanitize and deodorize where necessary. We also offer a variety of barrier products to protect trees and shrubs from damage and to keep animals from entering a crawlspace or underneath a porch. You may send us 5 to 10 digital pictures of your porcupine problem and we will give you a FREE cost estimate over the phone. Prices will vary depending on the severity of the problem and on the time spent on the job. Wild animals can be unpredictable; every job is unique and our solution will be custom fit to your situation. Check with your insurance for coverage. Read more about this pest animal at our Porcupine FAQ. 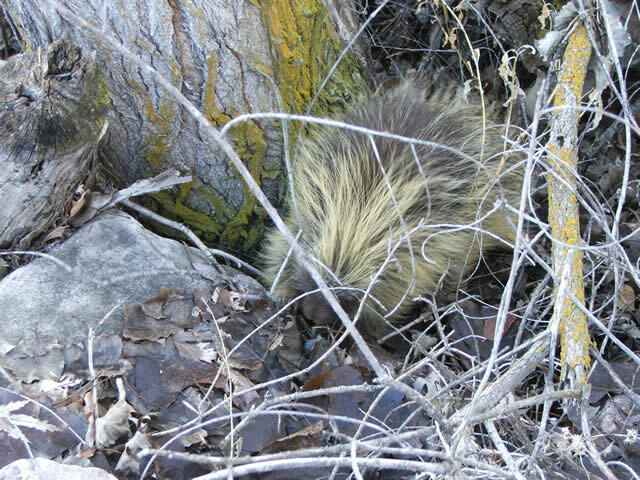 Porcupines damage trees and are dangerous for curious humans and pets. 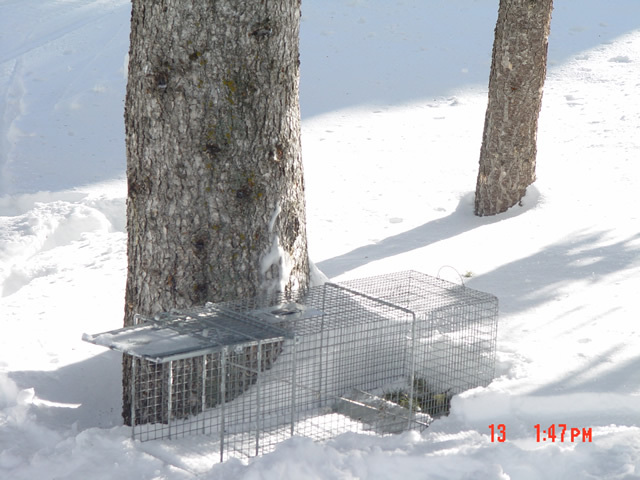 This porcupine trap is properly baited and ready for action. We provide porcupine removal from residential, business and commercial areas. 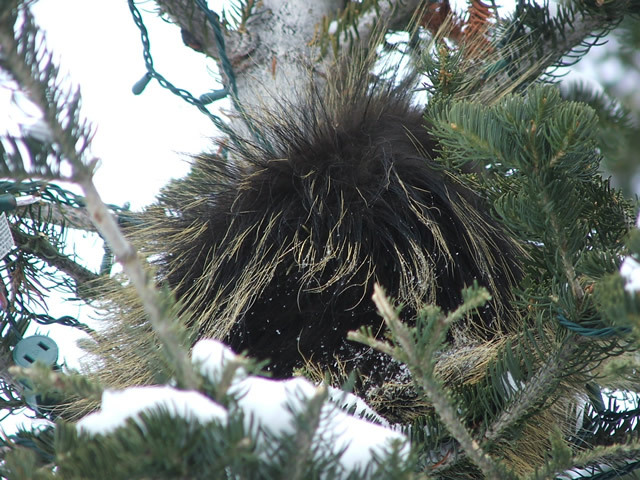 Porcupine eating habits cause significant damage to trees. They also chew on leather and bone. 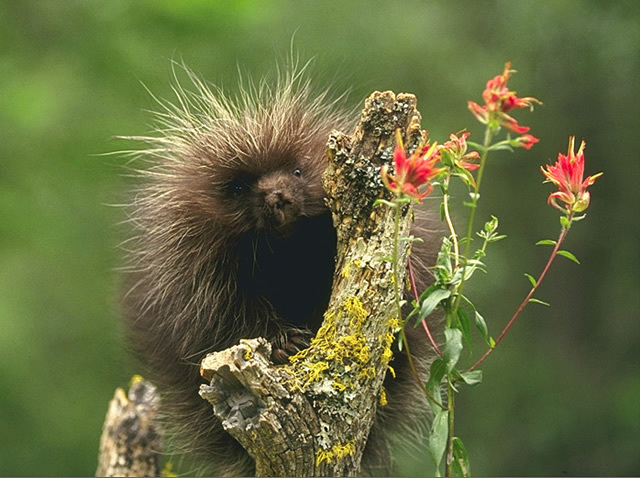 The North American tree porcupine is commonly found in wooded areas of North America, with the exception of the Southeastern states. 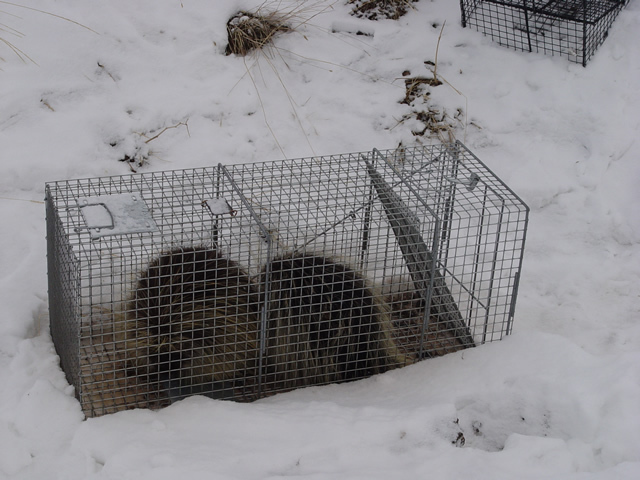 Trapping porcupines is a highly effective means of animal control.